In a Nutshell: The rise of the internet and pervasiveness of online travel agencies (OTAs) have made it more convenient than ever for consumers to compare prices and book hotels. But consumers often wind up paying higher prices because of commission fees from the OTAs, which are built into booking rates. And hotels are constrained by rate parity agreements, that limit their competitiveness in the marketplace. LockTrip is working to disrupt the industry through its blockchain platform that removes intermediary OTAs from the booking process to bring lower rates to consumers. It is also launching a distributed inventory database to return pricing power to hotels. The last 20 years have been a transformative period for the travel industry. Travelers used to call hotels themselves, or they would rely on travel agents to find and book hotel rooms for them. Or they would just wing it and hope they didn’t see a No Vacancy sign when they arrived at their destination. With the rise of the internet, booking websites put information about hotel prices and availability at consumers’ fingertips. But this convenience comes at a price. Whether they realize it or now, consumers pick up the tab for commission and processing fees, and are obliged to bear partiy price agreements between online booking services. Now, with the advent of blockchain, savvy travel companies are finding ways to leverage the young technology to potentially revolutionize the space. LockTrip is one of those companies. But those are exactly the things that LockTrip is now talking about — and implementing — through its platform. From the consumer’s perspective, online travel agencies simply appear to aggregate prices, provide an array of booking options, and help facilitate the booking process. But LockTrip offers a different point of view from within the industry. 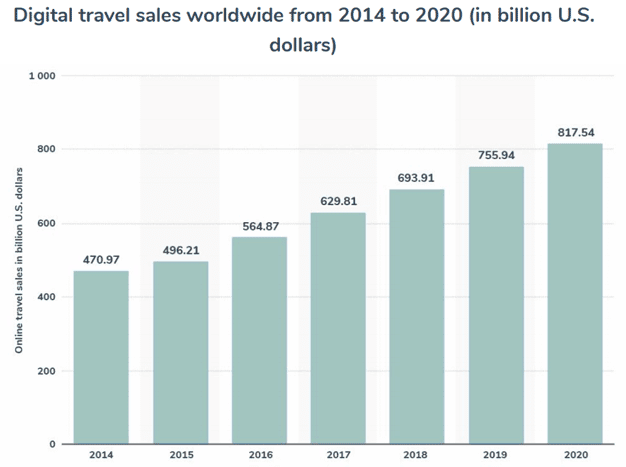 Digital travel sales have steadily increased since 2014 and are predicted to continue to rise through 2020, according to LockTrip. OTAs do provide a convenient way to compare hotel prices and check availability. But to facilitate booking rooms for travelers, these OTAs charge hotels around 20% in commission fees to provide its service, according to LockTrip, a cost that is often passed along to the consumer. So why not simply book directly with the hotel and skip the OTA?